Geneva Sweet ran an orange extension cord past Mayva Greenwood, Beloved Wife and Mother, May She Rest with Her Heavenly Father. Late morning sunlight pinpricked through the trees, dotting a constellation of light on the blanket of pine needles at Geneva’s feet as she snaked the cord between Mayva’s sister and her husband, Leland, Father and Brother in Christ. She gave the cord a good tug, making her way up the modest hill, careful not to step on the graves themselves, only the well-worn grooves between the headstones, which were spaced at haphazard and odd angles, like the teeth of a pauper. She was lugging a paper shopping bag from the Brookshire Brothers in Timpson along with a small radio from which a Muddy Waters record, one of Joe’s favourites, whistled through the speakers— Have you ever been walking, walking down that ol’ lonesome road. When she arrived at the final resting place of Joe “Petey Pie” Sweet, Husband and Father and, Forgive Him, Lord, a Devil on the Guitar, she set the radio carefully on top of the polished chunk of granite, snapping the power cord into its hiding place behind the head- stone. The one next to it was identical in shape and size. It belonged to another Joe Sweet, younger by forty years and just as dead. Geneva opened the shopping bag and pulled out a paper plate covered in tinfoil, an offering for her only son. Two fried pies, perfect half-moons of hand-rolled dough filled with brown sugar and fruit and baptized in grease—Geneva’s specialty and Lil’ Joe’s favourite. She could feel their warmth through the bottom of the plate, their buttery scent softening the sharp sting of pine in the air. She balanced the plate on the headstone, then bent down to brush fallen needles from the graves, keeping a hand on a slab of granite at all times, ever mindful of her arthritic knees. Below her, an eighteen-wheeler tore down Highway 59, sending up a gust of hot, gassy air through the trees. It was a warm one for October, but nowadays they all were. Near eighty today, she’d heard, and here she was thinking it was about time to pull the holiday decorations from the trailer out back of her place. Climate change, they call it. This keep up and I’ll live long enough to see hell on earth, I guess. She told all this to two men in her life. Told them about the new fabric store in Timpson. The fact that Faith was bugging her for a car. The ugly shade of yellow Wally painted the icehouse. Look like someone coughed up a big mess of phlegm and threw it on the walls. She didn’t mention the killings, though, or the trouble bubbling in town. She gave them that little bit of peace. 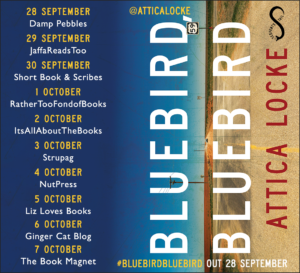 If you like the sound of Bluebird, Bluebird then it’s available in ebook and hardback. 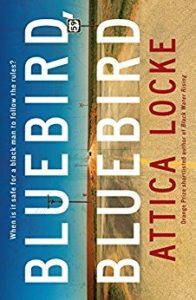 Attica Locke’s first novel, Black Water Rising, was shortlisted for the Orange Prize, nominated for an Edgar Award, an NAACP Image Award and a Los Angeles Times Book Prize. Her most recent book, The Cutting Season, was published in 2012 to critical acclaim. Attica is also a screenwriter who has written movie and television scripts for Paramount, Warner Bros, Disney, Twentieth Century Fox, Jerry Bruckheimer Films, HBO, Dreamworks and Silver Pictures. She is currently a co-producer on the hit show Empire. 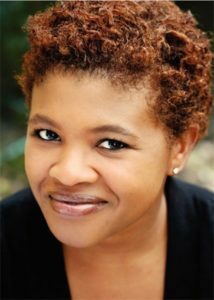 She was also a fellow at the Sundance Institute’s Feature Filmmakers Lab and is a graduate of Northwestern University. A native of Houston, Texas, Attica lives in Los Angeles, California, with her husband and daughter.